Chelsea and Tottenham are reportedly among the clubs interested in West Brom striker Salomon Rondon ahead of a potential transfer battle this summer. The Baggies ace is attracting interest from the Premier League after his side’s relegation to the Championship, and has a tempting release clause of just £16million, according to the Daily Mirror. 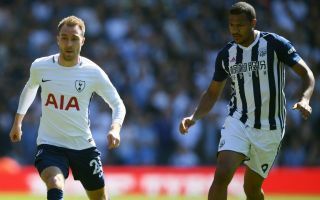 Spurs could certainly do with a cheap, experienced front-man in the Rondon mould to replace the struggling Fernando Llorente, who has had an unconvincing single season in north London. Chelsea could spoil their plans by moving for him as well, however, with the Mirror mentioning the Blues as surprise suitors for the 28-year-old. While it remains to be seen what the west Londoners plan to get out of the player, it may be that they too feel the need for more depth up front. Olivier Giroud arrived as a backup to Alvaro Morata in January but ended the season largely ahead of the Spanish flop in the starting XI. Salomon Rondon to Chelsea or Tottenham this summer? It could now be that the former Arsenal man will lead the line for Chelsea next season and Rondon would be the option from the bench, as he seems unlikely to be being targeted to be first choice. The Venezuela international scored 28 goals in three seasons with West Brom and doesn’t exactly scream top six material, at least not as a regular starter. Still, his reported £16m buy-out clause makes him a tempting option on the cheap to provide depth for clubs who’ll certainly need it next term.